Posted on October 13, 2014	by Katy K.
Not long after I finished reading the Kate Milford books the Book Smugglers sent me, her latest book came into the library! Milo has grown up in an old mansion in the smuggling town of Nagspeake that has long since been converted to a small hotel used mostly by smugglers. He’s an introverted type who takes comfort in his routines, so it’s very disturbing to him when their normally peaceful and empty Christmas break is interrupted by the sudden arrival of a whole lot of guests. Curiously, all of the guests seem to be inventing other business, but mostly interested in the house itself. There are so many guests that Milo’s parents call the cook back from her vacation. Meddy, the cook’s daughter, befriends Milo and introduces him to the concept of role-playing games. While they don’t start an official campaign, they make up characters for themselves – Negret and Sirin, blackjack and scholiast – specifically to investigate the mysteries behind the guests and the rash of stolen objects that crop up. The role-playing with its sets of published books, 30 years or so old in the story when I know they first started being published like that in the 1980s, was the thing that set this story most firmly in about the present time for me, though it wouldn’t for those less geeky. Otherwise, it’s quite nebulous in that there are cars, telephones and electricity, but none of the other technological devices that change so quickly that they could date the story, a nice touch. But the role-playing is very important to the story. Milo himself has Chinese ancestry, though he was born locally and adopted by his parents. Though he loves them, he wonders about his birth parents. As he answers questions about the character Negret for Meddy and himself, he grows more comfortable with his relationship with his adopted father and what he might have inherited from his birth parents. Pretending to be a character who is confident around people winds up, perhaps predictably but very satisfyingly, making him more self-confident in general. It’s worth noting, too, that Milford manages to give Milo two living parents who love him and check in on him to make sure he’s all right, but still give him enough space to go having his adventures with Meddy. 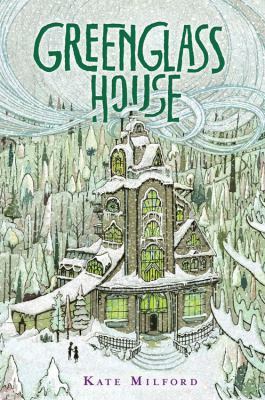 The house is a delightful part of the story – large and complicated, with an attic filled with old and exciting treasures and stained-glass windows with secrets built into them. There is mystery and adventure with an underlying thread of magic and great characters, plus a twist that maybe I should have seen coming, but didn’t. Everything comes together just right, making this one of my favorite books this year. Elizabeth Bird’s review at Fuse 8 Productions, with great thoughts on breaking the rules of children’s literature. Maureen at By Singing Light, who seems to have enjoyed it as much as I did. Cindy at Fantasy Book Critic, who didn’t like it so well. Sherry at SemiColon Blog, with thoughts on its timeless feeling. This entry was posted in Books and tagged Asian-American, diversity, Kate Milford, Mystery, smugglers, youth fantasy. Bookmark the permalink.